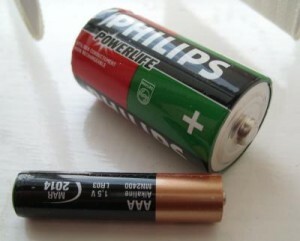 Cells and batteries provide an electrical current which always flows around the circuit in the same direct, this is called direct current (DC). 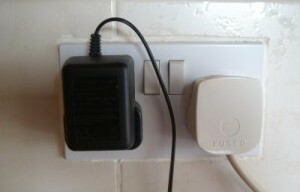 In the UK mains electricity is supplied at about 230 volts and is supplied as (AC) or alternating current. This means the current flows in one direction then the other around the circuit. The current constantly changes direction (alternates) and so it is called (ac) alternating current. In the UK the frequency of mains electricity is 50 Hz, this means 50 cycles in one second. We can use an oscilloscope to represent an AC signal. 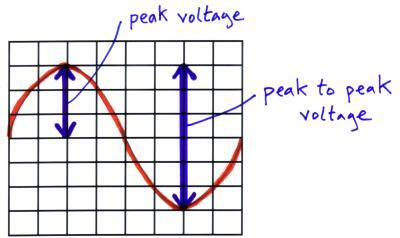 the peak to peak voltage = 6 squares from the highest point to the lowest and each square is worth 10V. So the peak to peak voltage = 60 V.
Once we know the peak voltage ( Vo ) and the resistance (R) in the circuit we can calculate the peak current ( Io ) using the equation V=IR. As the p.d. and current are varying continuously in an AC signal we need to represent an average value for p.d. and current. The root mean square values of p.d. ( Vrms ) and current ( Irms) represent the effective value of the p.d. and current in an AC circuit.